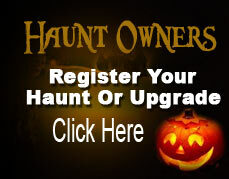 Haunted House Directory: Haunted House Ratings is the best online directory for Halloween Haunted Houses! From New York City to Dallas Fort Worth Texas, Atlanta Georgia to Los Angeles California, You Vote, We display the results! Golden Ghost Award: 8 out of 10 Ghosts! Opens at 7pm. We stop admitting traffic onto the property at 10pm on Fridays and Saturdays, and 9pm on Sundays, but we continue to operate all of the attractions until everyone has been through them. There is no age limit; however, we do not recommend our attractions for young children as they are scary. Parents/Guardians are advised to use discretion. Jason’s Woods is located near Lancaster in South-Central Pennsylvania.